RINA is a new network architecture that is based on the fundamental principle that networking is inter-process communication (IPC). It recurses the IPC service over different scopes. The current Internet architecture is built around layers of different functions, where the Network Layer provides a technology-independent abstraction on top of a large set of autonomous, heterogeneous networks. The Internet Protocol (IP) is one mechanism for achieving such an abstraction. By making the choice for a rudimentary ``best-effort" service, the Internet has not been able to effectively respond to new requirements (security, manageability, wireless, mobility, etc.) Today, Internet Service Providers (ISP's) may be willing to provide better than best-effort service to their customers or their peers for a price or to meet a Service Level Agreement (SLA). The lack of a structured view of how this could be accomplished, given the current IP model, has led to numerous ad hoc solutions that are either inefficient or incomplete. The current Internet architecture has its shortcomings: (1) exposing addresses to applications, (2) artificially isolating functions of the same scope: transport and routing/relaying are split into two layers: Data Link and Physical layers over the same domain/link, and Transport and Network layers internet-wide, and (3) artificially limiting the number of layers (levels). On the other hand, RINA leverages the inter-process communication (IPC) concept. In an operating system, to allow two processes to communicate, IPC requires certain functions such as locating processes, determining permission, passing information, scheduling, and managing memory. Similarly, two applications on different end-hosts should communicate by utilizing the services of a distributed IPC facility (DIF). A DIF is an organizing structure---what we generally refer to as a “layer.” What functions constitute this layer, however, is fundamentally different. A DIF is a collection of IPC processes (nodes). Each IPC process executes routing, transport and management functions. 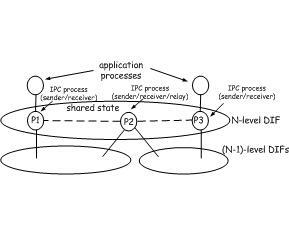 IPC processes communicate and share state information. How a DIF is managed, including addressing, is hidden from the applications. RINA is a clean-slate internet architecture that builds on a very basic premise, yet fresh perspective that networking is not a layered set of different functions but rather a single layer of distributed Inter-Process Communication (IPC) that repeats over different scopes---i.e., same functions / mechanisms but policies are tuned to operate over different ranges of the performance space (e.g., capacity, delay, loss). Specifically, a scope defines a Distributed IPC Facility (DIF) comprised of the set of IPC processes, running on different machines, that collaboratively provide a set of well-defined flow services to upper application processes. Application (user) processes can themselves be IPC processes of an upper DIF that is providing services over a wider scope.